So much for the idea that independent movies and the people who made them would lose out in this year's Academy Award nominations. Keisha Castle-Hughes, a 13-year-old from New Zealand, is up for Best Actress for a movie called "Whale Rider." Nicole Kidman, who won the award last year, was passed over for her work in the big-budget film "Cold Mountain." 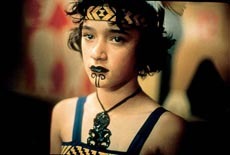 Keisha Castle-Hughes as "Paikea" in "Whale Rider. "Lost in Translation," a low-budget character study centered on two lonely Americans in Tokyo, is nominated for Best Picture. "Cold Mountain," a Civil War epic based on a best-selling novel, is not. "American Splendor," about the comic book writer Harvey Pekar, and the Brazilian drama "City of God" won adapted screenplay nominations. "Cold Mountain" and "Master and Commander: The Far Side of the World," a historical naval drama, did not. But if Academy members were chilly to "Cold Mountain" (which received seven nominations nonetheless), some things went according to form in the nominations announced yesterday for the 76th Academy Awards. "Lord of the Rings: Return of the King" cemented its status as Best Picture favorite by scoring 11 nominations, the most for any picture this year. None of them was for acting, however, and that had never happened for a film with so many nominations. In fact, "Master and Commander," the runner-up with 10 nominations, also got ignored in the acting categories even though its star, Russell Crowe, is a former winner and perennial nominee. Bill Murray, right, in a scene from "Lost in Translation." Joining "Lord of the Rings," "Master and Commander" and "Lost in Translation" for Best Picture honors are the intense revenge drama "Mystic River" and the inspirational horse-racing film "Seabiscuit." The nominees for Best Actor are Johnny Depp for his eccentric, crowd-pleasing turn as a heavily eyelined buccaneer in "Pirates of the Caribbean," former Oscar winner Ben Kingsley as an Iranian emigre battling to keep his new domicile in "House of Sand and Fog"; Jude Law as a soldier trying to get home in "Cold Mountain"; Bill Murray as a melancholy actor adrift in a foreign culture in "Lost in Translation"; and Sean Penn as the father of a murdered girl in "Mystic River." Castle-Hughes, the youngest Best Actress nominee in history, will face off against Diane Keaton (her fourth nomination in as many decades) as a neurotic writer in "Something's Gotta Give"; Samantha Morton as the wife and mother in an immigrant Irish family in "In America"; Charlize Theron as a serial killer in "Monster"; and Naomi Watts as a homemaker overwhelmed by tragedy in "21 Grams." "Diane Keaton in "Something's Gotta Give." Several factors appeared to conspire this year against the chances of movies from smaller producers and distributors. The Oscar ceremony was moved up a month, to Feb. 29, rushing the nomination process and leaving less time for potential nominees to be screened. Also, a ban on screener videos (later overturned in court) threatened to keep Academy members from seeing many of the lesser-known films. Instead, the nominations seem more eclectic than usual. Tiny Newmarket Films had two Best Actress nominees, Castle-Hughes and Theron. Only two of the five supporting actor nominees, Tim Robbins ("Mystic River") and Ken Watanabe ("The Last Samurai"), appeared in films from a major studio. It is Robbins' first acting nomination. The other hopefuls in the category are former Oscar winner Benicio Del Toro for "21 Grams" and first-time nominees Alec Baldwin for "The Cooler" and Djimon Hounsou for "In America." Two of the five supporting actress nominees were from small films, Patricia Clarkson ("Pieces of April") and Holly Hunter ("Thirteen"), a former Oscar winner. Another nominee in the category, Shohreh Aghdashloo ("House of Sand and Fog"), is an Iranian appearing in her first major American film. Rounding out the nominations are former Oscar winner Marcia Gay Harden for "Mystic River" and Renee Zellweger, getting her third nomination in as many years, for "Cold Mountain." Charlize Theron portrays Aileen Wuornos in a scene from "Monster." The acting nominees also display ethnic diversity. They include performers who were born in Japan, Iran, Benin, Australia, New Zealand, South Africa, Puerto Rico and Great Britain. "City of God" is the rare foreign-language film to get as many as four nominations, including one for director Fernando Meirelles and another for screenwriter Baraulio Mantovani. The movie was eligible but not nominated last year in the foreign-language category. A recent Oscars rule change allowed it to compete in the other categories this year. Meirelles took the directing spot that might otherwise have gone to Gary Ross, director of "Seabiscuit," the only Best Picture nominee without a corresponding nod for its director. Sofia Coppola ("Lost in Translation") is the first American woman nominated for best director. She was also nominated for the film's screenplay and, as a producer, would share in a Best Picture award. Her father, Francis Ford Coppola, and grandfather, Carmine Coppola, already own Academy Awards. A win for Sofia in any category makes the Coppolas the second family with three generations of Oscar winners (the other: Walter, John and Anjelica Huston). Nominees for Best Animated Film are "Brother Bear," the French film "The Triplets of Belleville" (opening Friday at the Regent Square Theater) and the box-office favorite "Finding Nemo," which got four nominations including score and screenplay. Internet bookmaker Intertops.com has set betting odds for the Oscars, which will be telecast live at 8:30 p.m. Feb. 29 on ABC. It has established "Lord of the Rings: Return of the King" as favorite for Best Picture; Peter Jackson, who filmed the "Rings" trilogy, as Best Director; and Murray, Keaton, Del Toro and Zellweger as the acting favorites. Post-Gazette movie editor Ron Weiskind can be reached at rweiskind@post-gazette.com or 412-263-1581.